My twin boys are now 2 1/2-years-old and I've been dreading starting to potty train two kids at once. Our routine is finally in a groove and just the thought of throwing a new wrench in the mix is giving me a headache. To start the process and make the transition easier, we've switched to Pampers Easy Ups training pants. Easy Ups are designed to help the diaper-to-underwear transition by allowing potty-training toddlers to set aside their diapers and wear something with more of an underwear-like look and feel that still helps contain accidental messes no matter whether they happen at home, on-the-go or overnight. My boys meanwhile went crazy over the fact that Thomas the Tank Engine is on the boys version of Easy Ups as it's one of their favorite programs. They especially love dancing to the theme song. I also found that Easy Ups are quicker for parents to put on their wiggly and busy toddlers than traditional diapers. In order to further prepare, we are working on "potty learning." 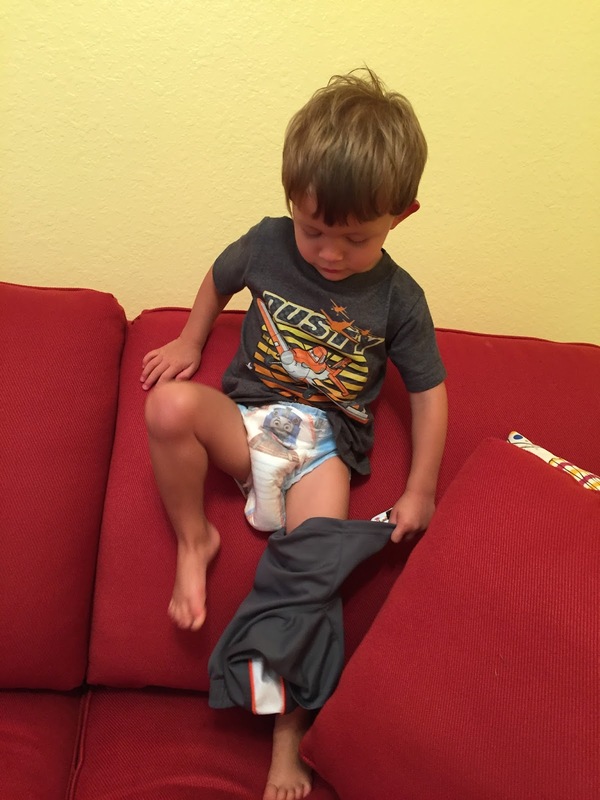 We have been encouraging the boys to start pulling down their own pants and diapers by themselves, which Logan is doing in the photo on the left. We have also been working on getting them to better communicate to us when they have poop in their diapers. Ben has this down, but Logan just ignores my question all together, lol. Another great tool has been reading potty books to them each night. We like: Once Upon a Potty and Caillou: No More Diapers. Outfit your home for potty training! We bought two of these Summer Infant Lil' Loo Potties in different colors. We put them wherever the boys are and bribe them with marshmallows for sitting on the potty. We also bring it with us when we travel and in the trunk of the car for when we're on-the-go. Book "It's You and Me against the Pee... and Poop too!" 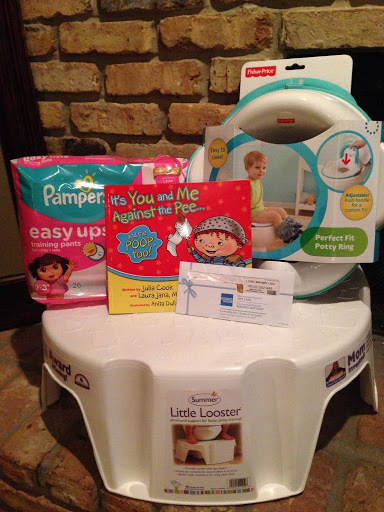 Disclaimer: This review and giveaway was made possible by Double Duty Divas and Pampers. I was compensated for my participation in this campaign, but all opinions are 100% mine. Be as patient as possible and I find using a reward system works well. My best Potty training tip is to use a child's potty training chair that sits on the floor. This makes it easier for child and they will not be so intimidated by the big people's toilet! I know it really helped me when training my daughter. My tip is to wait until the child is ready. Starting too soon just becomes frustrating for the parent and the toddler. Use a good reward system that works for your child. My son always liked M&M's. Is to just be patient!!! I find myself getting frustrated trying to potty train my twin daughters - not good!!!!!!!!!! My best tip is to be persistent. Some kids take longer than others. One of the most important things you'll need to teach your daughter is how to wipe properly. Explain that she needs to make sure she moves the toilet paper from front to back, especially when she has a bowel movement, to avoid getting an infection. I notice so many people mention this http://bit.ly/1DOLhgg, you may just be surprised to find out potty training doesn't have to be hard or stressful. My tip is to train during the warmer months so its easier for them with less clothing and patience. make sure you always encourage your child.. and reward them when they do go to the potty. My best tip is when they do a good job reward them, make it fun. Also be really supportive. My best advice is to praise the successes and overlook the other. We jusy go about once an hour and try, and then remind, and give hugs and kisses for trying and success. Be consistent and use rewards. I recommend lots of praise for successes and patience for accidents. My best tip is to have a good reward system set in place to keep your child motivated! Wait until your child is ready. We put a basket of books next to the potty chair and we would read stories as he would sit on the potty! He loved potty time! No kids, so no advice. Patience is good. Our tip includes using some kind of incentive program like candy or stickers to encourage pottying. Use a reward system for the child as an incentive. My tip is to be patient and not freak out when they have an accident. My tip is to expect accidents even after they seem to get it. And use positive reinforcement rather than punishment. I don't have kids, so I really don't have a tip. I would assume that being patient is key! My biggest tip is to not get frustrated. Kids can sense the frustration and it makes it harder for them. Don't compare your child to other kids too much. Not everyone is ready at the same time. My tip is to use a reward system as well as be patient with the process. Thanks for having this giveaway! What a nice prize pack. A rewards system always works really well. I think every child is different, so different methods will work for different kids. We have done sticker charts and rewards. Have patience when potty training and realize that all children are different so take cue form the child as to whether or not they are ready. Create a few fun potty games. When we were potty training our son, my hubby got our son matching “manly-man” underwear, they would spend Saturday mornings, lounging in their t-shirts/undies, watching cartoons. My son would also follow him into the bathroom. We had him trained in no time, thanks to the father/son bonding time. My advice is to have patience and offer rewards when they go! Just relax and remember that each child is different - it's not a race. My best tip is to make sure you and your child are relaxed when they go to the potty. They are more eager to use it when there is no stress. My best piece of advice is to wait until the child is ready to initiate potty training. If you push them before they are ready, you may both wind up very frustrated! Wow This is wonderful post and Great advice! Potty Training in 3 Days is very useful page for our baby. It is so much faith and most effective choice for potty training in 3 days guide. Thanks for sharing valuable information. After two utterly miserable weeks of my husband and I trying to train our son on our own to go to the bathroom ... I decided to find a method to help me teach my son go to the bathroom. My son was in the stages furthest from the regression, kicked and screamed when he would sit on his potty. Not to mention to go into hiding whenever he had to go. We use the methods of a book that you download from the internet and I was speechless after my husband and I attended our son sitting in her bathroom, all by itself! 4 days in your program and regression were corrected and we had our first day accident free. These are all excellent tips; potty training can be such a stressful time, both for parents and children! When it comes to potty training, its time to ease your “baby” into a very huge change. Sometimes you can be a little bit abrupt, and sometimes its better to take your time.